Music is his life. GRAMMY Award winning super producer Rodney "Darkchild" Jerkins is an actual urban legend, in the flesh. An acknowledged virtuoso in the music industry, Jerkins began his career at the prodigy‐like age of 15. Tireless in his work ethic, the prolific young Jerkins quickly established himself as a formidable musical force, with a trail of outstanding accomplishments writing his indelible page in music history. A wildly successful producer/songwriter/musician, Jerkins has been an in‐demand producer since his early beginning; megastars line up to work with him, to insure that next smash. He has added to the hit lists of music talents such as Sam Smith, Mary J. Blige, Beyoncé, Justin Bieber, Madonna, Brandy, Jennifer Lopez, Michael Jackson, Whitney Houston, Toni Braxton, Kelly Clarkson, Keyshia Cole, Britney Spears, Cher, Janet Jackson, Destiny's Child, Natasha Bedingfield, The Pussycat Dolls, N'Sync, Gwen Stefani, Fantasia, Ludacris, Jamie Foxx, Black Eyed Peas, Mario, Monica, Ciara, Tiffany Evans, Trinitee 5:7, TLC, The Spice Girls, Vanessa Williams, J. Holiday, Joe, Ray J, Maroon 5 and countless others. They know that having the "Darkchild" touch on their song puts it on the fast track toward reaching Number One. Jerkins is a dynamic music master, whose undeniable magic touch infuses his productions with a one‐of‐a‐kind, unmistakable winning sound. His utilization of live instruments and his trained ear consistently produce tracks that are imbued with "that certain something." The Darkchild instinctively knows how to showcase the best attributes of each artist that he works with. CEO of his Darkchild Productions, Inc., Jerkins has been responsible, through his numerous hit productions, for over 170 million in record sales worldwide. Born the youngest son of a minister father and choir director mother in Pleasantville, New Jersey in 1977, Jerkins began taking classical piano lessons as a child and combined that with the gospel music that he heard in church. Rodney's God‐given gifts quickly blossomed, as the young phenomenon diligently worked on his music and began recording demos for local talent. When New Jack Swing's Teddy Riley came across one of those early demos and opened the first door, Rodney's career took off like a rocket. Subsequently, his first professional writing and producing job came in 1994, for an artist named Casserine and at the tender age of 15, he and his brother, Fred Jerkins III, wrote and produced his gospel rap album, "On The Move." Since that time and continuously into present day, the Jerkins discography reads like a Who's Who of Hit Music. In 1997, Jerkins continued his ascent to legend status by working with Mary J. Blige; he co‐wrote, arranged and produced five songs for her four‐time platinum CD, "Share My World," including the hit single "I Can Love You." That year, Billboard magazine touted him as one of the hottest R&B producers in the country, and again bestowed that moniker on him in 1999. He re‐teamed with Blige in 2006, with his production of her huge hit, "Enough Cryin," from her record‐setting CD, "The Breakthrough." Rodney's 2006 production of Beyoncé’s Number One smash "Deja Vu," dominated the airwaves and garnered him another Grammy nod in the process. A testament to its greatness and his genius, the perennial, memorable tune was highlighted during Beyoncé’s 2008 Grammy Awards telecast performance. The Darkchild has also lent his formidable talents to cinematic music, having contributed music to numerous movie soundtracks. Among them are the films "Honey," "Scary Movie 3," "Blue Streak," "My Baby's Daddy" and "Rush Hour 1 & 2”. Rodney was the Executive Producer of the score and soundtrack for the hit film “Confessions Of A Shopaholic” starring Isla Fisher and most recently, Nickelodeon’s movie “Ragz” in which Rodney Executive Produced the score and soundtrack. The small screen has benefited from the Jerkins touch as well, as Rodney wrote and produced the theme song for TV One's hit reality show, "I Married A Baller." He also appeared on the show. The consummate businessman, the multi‐faceted Jerkins has a joint venture label deal with Capitol Records called Evolve Music, along with a Christian division called Lifestyle Music. New releases from his artists are scheduled for 2016. Another hat Rodney wears well comes via his joint venture deal with BMG Music Publishing. Through that affiliation, he flexes his publisher arm, signing new writers, established writers and buying existing catalogs. Jerkins is not too busy to get involved with philanthropy. He hosted the Red Carpet For Humanity charity benefit, whose mission was to raise funds to build a safe haven at the Dream Center in Los Angeles, where the work of tackling a variety of social ills, both global and domestic, such as AIDS outreach, African water wells, human trafficking, drug/alcohol abuse, depression and others. Rodney also produced a remake of the classic 70's Sister Sledge anthem, "We Are Family," reuniting that group's four members for the first time in 20 years and joining them with a stellar group of vocalists that included Patti LaBelle, Brian McKnight, Ciara, Chris Brown, Christina Milian, BeBe Winans, Branford Marsalis, George Clinton, Lyfe Jennings, Mary Mary and Ray J, to create a song to benefit Hurricane Katrina's displaced families, via the Points of Light Foundation. Happily married to Lifestyle Music artist, Joy Enriquez, Rodney is also the father of four children, Rodney David Jerkins III, Heavenly Joy, Hannah Joy and Royal David Jerkins in Los Angeles. Jerkins also produced her latest Contemporary Christian album and debut of his Christian label, Lifestyle Music, titled “The Call” in partnership with Capitol Christian. He says "this is what the world needs right now, and we are happy to be the ones that God is using to deliver it." A devout Christian with strong moral values, Rodney has not forgotten his roots in the church, nor does he compromise in order to conform to today's music landscape; instead, he consistently uses his myriad talents to shape groundbreaking music on his own terms. 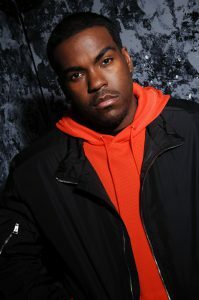 Rodney "Darkchild" Jerkins seldom rests, constantly raising the musical bar as he sets a new standard, creating his own unique niche in music. He loves his work and it shows in all the carefully crafted projects that he fashions. It's apparent that he was destined for greatness; his singular focus toward quality and excellence in music is what sets him apart from the rest. Recently, Rodney has completed work on Rihanna, Ariana Grande, Jessi J, Justin Bieber, Ciara, Keyshia Cole, Alicia Keys, and Sam Smith.